It is a mistake to assume you have eliminated the biggest expense in owning a car when you make the initial purchase. The reality is, the cost of running a car in the UK is higher than ever and will really eat into your savings. Petrol prices remain high and though we are now through the dreaded ‘credit crunch’, there is little relief for families who find the cost of owning a car is still too much. Typically, you can expect fuel, insurance and depreciation to be the main cost factors to consider. However, there are plenty of ways for clever drivers to reduce their costs and enjoy the feeling of having a little extra money in their pocket. Websites such as www.petrolprices.com do a great job of finding the cheapest petrol in your area. If you sign up you can also benefit from regular price updates. For example, I was in Leicester recently and found an incredible disparity in prices thanks to the aforementioned prices. Near my location the cheapest unleaded was 12.2p less per litre than the most expensive station and the cheapest diesel was 14.2p less. The amount of fuel you use is dictated by how you drive. According to the AA, the most ‘efficient’ driving speed is 56mph but if you are on motorways you should be aiming to hit 70mph. If you are tempted to be a ‘speed demon’ on the motorways, bear in mind that travelling at 85mph can reduce your fuel efficiency by as much as 25%! It is also a good idea to move up a gear ASAP without forcing the engine to work harder and you should always have your tyres fully inflated to improve traction. Avoid crowded roads, loaded boots and use air conditioning only when necessary. This is probably one of the most obvious tips around but incredibly few people pay any attention to this advice. 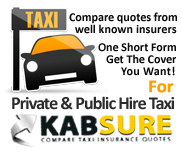 You can go to PrivateHireInsurance.net for comparisons from hundreds of reputable insurers and find the cheapest and most suitable insurer for your needs. Quick tips to lower your insurance including adding a named driver on the policy, fitting your car with security features such as an immobiliser and paying the full amount up front. The average person only looks at five policies before making a purchase; with such great comparison sites available, there is no excuse for not digging deeper. You should also avoid ‘added extras’ such as breakdown insurance as these can be purchased for a cheaper price as a separate policy. Finally, look to pay an excess of up to £500 as the vast majority of car repairs are cheaper and for minor repairs you want to avoid making a claim. For instance, if you are involved in an accident and it causes £375 of damage to your car but you only have an excess of £300, you have to pay the £300 to get the problem fixed AND your premium will rise next year because you made a claim. Having a reasonably sized premium tells your insurer that it won’t have to pay for minor scrapes so it drops the price of your premium. You need breakdown cover because you will be forced to pay almost £100 any time you get stranded due to even relatively minor faults such as broken clutches or flat batteries. You should look to the AA or RAC for low priced breakdown cover. However, it is still important to compare because the aforementioned duo are not always the cheapest. Be sure to read the small print before signing anything; cheap policies often force you to pay an excess on every callout and others don’t help you if the breakdown occurs near your home. Additionally, there may be a limit to the number of times you can call a company out. A simple way to cut costs is to cover fewer miles. Frequent short journeys can really damage your engine and increase long-term costs. For long journeys, consider a train or bus if this is convenient and you can find low fares. If you book in advance you could save a considerable amount of money. Another great way to cut costs is through the process of car sharing. Millions of people across the UK are benefiting from car sharing and it could halve your annual costs. Websites such as www.blablacar.com have millions of members and are easy to join. If you currently drive an expensive model, switch it for something cheaper. Cars that cost £30,000 new will lose almost 19% of their value each year whereas cars that cost less than £10,000 may lose 12-15% of their value through depreciation annually. A £10,000 car will cost you around 17p a mile to run according to the AA but a £30,000 car costs you 28.5p a mile to run.